Houston Person wears the Boss Tenor crown, worn so long by Gene Ammons. Mr. Person is busy working his own gigs; booking his tours, finding new clubs, having phone numbers for every major concert promoter on every continent. He even produces his own albums. His first big break came while working as a sideman with organist Johnny Hammond and his group, co-led by Etta Jones. Mr. Person’s working relationship with Ms. Jones began in 1973 and lasted nearly thirty years, until her passing in 2001. 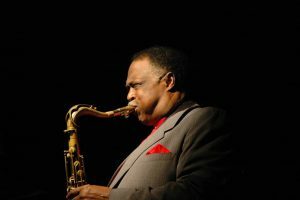 Early gigs happened while serving in the Army overseas in Germany, where he played with Eddie Harris, Cedar Walton and others. Houston Person has recorded more than 75 albums, many of which are still in print because his music is so compelling. PJS is thrilled to have Houston Person back where he belongs, opening our newest season of great Jazz in Mount Vernon! PJS Jazz Society presents the best in Jazz every Second Sunday at First Presbyterian Church, September through April. Two sets from 6:00-9:00 pm. Concerts are held in a cabaret setting. Additional parking available at the Holmes School (next to the First Presbyterian Church on Columbus Avenue).